This article is about the last Crusader state. For other uses, see Tripoli (disambiguation). The County of Tripoli in the context of the other states of the Near East in 1135 AD. Raymond IV of Toulouse was one of the wealthiest and most powerful of the Prince Crusaders. Even so, after the First Crusade, he had failed to secure any land holdings in the Near East. Meanwhile, the County of Edessa, the Kingdom of Jerusalem and the Principality of Antioch had been established. Tripoli was an important strategic goal as it linked the French in the south with the Normans in the north. It was a fertile and well populated area. In 1102, Raymond IV occupied Tortosa (now Tartus) and in 1103, he prepared, together with veterans of the 1101 crusade, to take Tripoli. On a natural ridge, which he named "Mons Peregrinus" (French: Mont Pèlerin, English: Mount Pilgrim), 3 kilometres (1.9 mi) from Tripoli, Raymond IV (also known as Raymond de Saint-Gilles) began the construction of a large castle, known in Arabic as Qal'at Sanjil. Despite this new fortress and seasoned troops, Raymond IV's siege of Tripoli failed to secure the port. He died on 25 February 1105. County of Tripoli coins: gold bezant with a text in Arabic (1270–1300), and Tripoli silver gros (1275–1287). British Museum. The extent of the County of Tripoli was determined in part by pre-existing Byzantine borders and in part by victory in battle, tempered by the demands of neighbouring crusader states. At its height, the county controlled the coastline from Maraclea in the north to Beirut in the south. Inland, the county's control extended to the Krac des Chevaliers fortress. The rich inland agricultural land of the Homs Gap was known as La Bocquée. The county was divided into 'lordships'; areas based roughly around its coastal ports. The Count of Tripoli himself held the port of Tripoli and its surrounds. He also controlled the hostile region of Montferrand, now modern-day Bar'in, Syria, lying to the east. Approximately one quarter of the land seized around Tripoli was given to the Genoese as payment for military aid. The Genoese admiral Guglielmo Embriaco was awarded the city of Jubail. Despite his contribution to its establishment, Baldwin I did not directly control the County of Tripoli. Nevertheless, the County of Tripoli owed fealty (allegiance) and homage (declarations of allegiance) to him, and he, in return, provided support to the county in times of trouble. Although occupying a narrow coastal plain, the mountain range beyond was a natural defensive line for Tripoli. Several castle forts were built to defend the mountain passes. Muslim forces (Turk and Egyptian) attacked the County of Tripoli along its borders, especially those to the east. 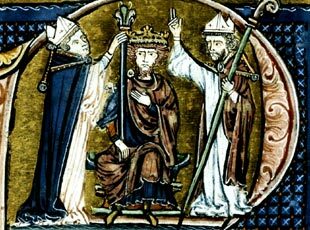 (p73) In 1137, Raymond II, the reigning count, lost control of Montferrand. The Muslim position strengthened when the Hashshashin (Nazari Ismailis) forces formed in the Nosairi mountains to the north. In 1144, in order to increase the county's defences, particularly against Zangi of Mosul, Raymond II gave the Knights Hospitaller large stretches of frontier land along the Buqai'ah plain. This included the castles of Krak des Chevaliers, Anaz, Tell Kalakh, Qalaat el Felis and Mardabech. (p30) In the 1150s, the defences were further strengthened by the presence of the Knights Templar at Tartus on the seashore. In religious matters, the counties of the Kingdom of Jerusalem were expected to follow the lead of the Latin Patriarch of Jerusalem. However, one of the Counts of Tripoli, Pons of Tripoli had formed an alliance with Antioch, and acknowledged the Latin Patriarch of Antioch. This was so even after a Papal edict to the contrary. As a vassal of the Kings of Jerusalem, Bertrand of Tripoli was drawn into war with the Seljuk Turks. In 1111, Mawdud ibn Altuntash, a Turkish military leader, campaigned against Antioch and Edessa. Bertrand of Tripoli and Baldwin I marched to defend the Christians in the north. In joining Tancred and the Count of Edessa at the Battle of Shaizar, their defence of the kingdom was successful. In 1119, the Seljuk Empire again attacked Antioch, winning the Battle of Ager Sanguinis. However, Count Pons of Tripoli and Baldwin II defended Antioch and, at the Battle of Hab, successfully defended the flank of the Christian forces. In 1125, Count Pons of Tripoli marched against the Turks who had again attacked Edessa, this time besieging the town of Azaz. Pons of Tripoli, Baldwin II and the Count of Edessa lured the Turks from Azaz and into an ambush on the plains, where the Turkish forces were defeated. On 29 June 1170, an earthquake struck the region. The defensive forts of Krac des Chevaliers, Chastel Blanc(p236) and al-'Ariymah were damaged. The cathedral of St Mary in Tripoli township was destroyed. The earthquake of 1170 resulted in a brief truce between Nur al-Din and the county (unlike a previous less severe earthquake of 1157 where fighting continued). Alfonso-Jordan (1103–1148) was the son of Raymond IV and his third wife, Elvira of Castile. Although he was born in Tripoli, Alphonso-Jordan was raised in France. In 1147, he joined the Second Crusade, which was launched in response to the loss of the County of Edessa to Turkish forces. Alphonso died, possibly poisoned, in Caesarea, in 1148. He had an illegitimate son, Bertrand of Toulouse, who continued his progress towards Tripoli. Count Raymond II (1115–1152), the grandson of Bertrand, Count of Tripoli, engaged his enemies, Nur al-Din and Unur of Damascus to confront his cousin, Bertrand. The Turkish forces, having only recently battled Raymond II at the Siege of Damascus, attacked the castle of Arima (al-Ariymah). (p224) They captured Bertrand of Toulouse, who spent the following decade in Muslim prisons. He was released in 1159 following the intervention of Manuel Comnenus, emperor of Byzantium. (p197) Raymond II later regained 'Araima. In 1152, Raymond II was killed by the Hashashin. He was the first recorded non-Muslim victim of this sect. This was the beginning of war between the Bohemond VII and the Templars." Guy II Embriaco of Giblet (1277–1282) was a former vassal of Bohemond VII in Jubail. Grievances between them had led to enmity and this was part of a larger trade war between Genoa and the Venetians. The Templars sought to unseat Bohemond VII by supporting Guy II Embriaco. Bohemond VII responded by sacking the Templar house in Tripoli and forests at Montroque. This action led to indecisive fighting over the following months at Botron, Fort Nephin, Sidon and at sea. In 1282, Guy II Embriaco and the Templars were ambushed in Tripoli. Guy II Embriaco, his brothers and cousins were imprisoned at Fort Nephin and left to starve. His followers were blinded. The Templars were summarily executed. After the death of Guy II Embriaco in 1282 and Bohemond VII in 1287, a power vacuum existed in Tripoli. The lords of the County of Tripoli organised and brought forth Benedetto I Zaccaria (1235–1307), a powerful Genoese merchant. They encouraged the Genoese to take control of the county. In Tripoli, a special social status had been granted to people from the great mercantile cities of Europe, especially those from the maritime republics of Italy, (Venice for example). They were not, however, ranked among the aristocracy. (p172) The communes elected Bartholomew Embriaco to the role of Mayor of Tripoli. He also promoted trade with the Genoese. Bohemond VII had no issue. His mother, Sybille of Armenia was discounted in the succession because she was the friend of the Bishop Bartholomew of Tortosa, considered an enemy of Tripoli. Bohemond VII's younger sister, Lucie, established herself at Fort Nephin with the support of the Knights Hospitaller. Eventually, Bartholomew Embriaco and the communes decided they could not rule. Benedetto I Zaccario declined to rule. Thus, after negotiations, Lucie became Lucia, Countess of Tripoli in 1288. Constant infighting, lack of resources, a series of poor harvests, changes to trade routes and the local economy and Muslim and Mongol military pressure led to the decline of the Kingdom of Jerusalem. (p7) By the 1280s, only two crusader states remained; the remnants of Jerusalem and the County of Tripoli. Even though the Mamluk government of Egypt had a treaty with the county, in March, 1289, Tripoli favoured an alliance with the Mongols as a result Sultan Qalawun of Egypt attacked Tripoli. Despite desperate defense operations, the county fell and was merged with Qalawun's empire. Raymond IV of Tripoli (1187–1189), son of Bohemond III of Antioch. ^ a b c Gregory, T. E. (2010). A History of Byzantium. John Wiley & Sons. p. 327. ISBN 978-1-4051-8471-7. ^ a b c Riley-Smith, J. (2012). The Knights Hospitaller in the Levant, C.1070–1309. Palgrave Macmillan. p. 174. ISBN 978-0-230-29083-9. ^ a b Madden, T. F. (2005). The New Concise History of the Crusades. Rowman & Littlefield. ISBN 978-0-7425-3822-1. ^ a b Kennedy, H. (1994). Crusader Castles. Cambridge University Press. p. 62. ISBN 978-0-521-79913-3. ^ a b Setton, K. M. (1985). A History of the Crusades: The Impact of the Crusades on the Near East. Univ of Wisconsin Press. p. 240. ISBN 978-0-299-09144-6. ^ a b Asbridge, T. S. (2000). The Creation of the Principality of Antioch, 1098–1130. Boydell & Brewer Ltd. p. 208. ISBN 978-0-85115-661-3. ^ a b Haag, M. (2012). The Tragedy of the Templars: The Rise and Fall of the Crusader States. Profile Books. p. 138. ISBN 1-84765-854-7. ^ a b c Boas, A. (2006). Archaeology of the Military Orders: A Survey of the Urban Centres, Rural Settlements and Castles of the Military Orders in the Latin East (c.1120–1291). Routledge. p. 131. ISBN 978-0-203-96481-1. ^ Peoples, R. S. (2007). Crusade of Kings. Wildside Press LLC. p. 54. ISBN 978-0-8095-7221-2. ^ National Geographic Society (1931). The National Geographic Magazine. Volume 59. National Geographic Society. ^ a b c Barber, M. (2012). The Crusader States. Yale University Press. p. 256. ISBN 978-0-300-18931-5. ^ Raphael, K. (1 January 2010). Ancient Earthquakes. Geological Society of America. p. 60. ISBN 978-0-8137-2471-3. ^ William of Puylaurens (2003). The Chronicle of William of Puylaurens: The Albigensian Crusade and Its Aftermath. Boydell Press. p. 17. ISBN 978-0-85115-925-6. ^ Northrup, L. (1998). From Slave to Sultan: The Career of Al-Manṣūr Qalāwūn and the Consolidation of Mamluk Rule in Egypt and Syria (678–689 A.H./1279-1290 A.D.). Franz Steiner Verlag. p. 152. ISBN 978-3-515-06861-1. ^ Folda, J. (2005). Crusader Art in the Holy Land, From the Third Crusade to the Fall of Acre. Cambridge University Press. p. 383. ISBN 978-0-521-83583-1. Wikimedia Commons has media related to County of Tripoli. Raymond IV, sometimes called Raymond of Saint-Gilles or Raymond I of Tripoli, was a powerful noble in southern France and one of the leaders of the First Crusade (1096–99). He was the Count of Toulouse, Duke of Narbonne and Margrave of Provence from 1094, and he spent the last five years of his life establishing the County of Tripoli in the Near East. Baldwin II, also known as Baldwin of Bourcq or Bourg, was Count of Edessa from 1100 to 1118, and King of Jerusalem from 1118 until his death. He accompanied his cousins, Godfrey of Bouillon, and Baldwin of Boulogne, to the Holy Land during the First Crusade. He succeeded Baldwin of Boulogne as the second count of Edessa when his cousin left the county for Jerusalem. He was captured at the Battle of Harran in 1104. He was held first by Sökmen of Mardin, then by Jikirmish of Mosul, and finally by Jawali Saqawa. During his captivity, Tancred, the Crusader ruler of the Principality of Antioch, and Tancred's cousin, Richard of Salerno, governed Edessa as Baldwin's regents. The Principality of Antioch was one of the crusader states created during the First Crusade which included parts of modern-day Turkey and Syria. The principality was much smaller than the County of Edessa or the Kingdom of Jerusalem. It extended around the northeastern edge of the Mediterranean, bordering the County of Tripoli to the south, Edessa to the east, and the Byzantine Empire or the Kingdom of Armenia to the northwest, depending on the date. Raymond III was count of Tripoli from 1152 to 1187. He was a minor when Assassins murdered his father, Raymond II of Tripoli. Baldwin III of Jerusalem, who was staying in Tripoli, made Raymond's mother, Hodierna of Jerusalem, regent. Raymond spent the following years in the royal court at Jerusalem. After he reached the age of majority in 1155, he participated in a series of military campaigns against Nur ad-Din, the Zengid ruler of Damascus. In 1161, he hired pirates to pillage the Byzantine coastline and islands to take vengeance of the Byzantine Emperor Manuel I Komnenos who had refused to marry his sister, Melisende. Raymond II was count of Tripoli from 1137 to 1152. He succeeded his father, Pons, Count of Tripoli, who was killed during a campaign that a commander from Damascus launched against Tripoli. Raymond accused the local Christians of betraying his father and invaded their villages in the Mount Lebanon area. He also had many of them tortured and executed. Raymond was captured during an invasion by Imad ad-Din Zengi, atabeg of Mosul, who gained the two important castles of Montferrand and Rafaniya in exchange for his release in the summer of 1137. Pons was count of Tripoli from 1112 to 1137. He was a minor when his father, Bertrand, died in 1112. He swore fealty to the Byzantine Emperor Alexios I Komnenos in the presence of a Byzantine embassy. His advisors sent him to Antioch to be educated in the court of Tancred of Antioch, ending the hostilities between the two crusader states. Tancred granted four important fortresses to Pons in the Principality of Antioch. Since Pons held his inherited lands in fief of the kings of Jerusalem, Tancred's grant strengthened the autonomy of the County of Tripoli. On his deathbed, Tancred also arranged the marriage of his wife, Cecile of France, to Pons. Bohemond III of Antioch, also known as Bohemond the Child or the Stammerer, was Prince of Antioch from 1163 to 1201. He was the elder son of Constance of Antioch and her first husband, Raymond of Poitiers. Bohemond ascended to the throne after the Antiochene noblemen dethroned his mother with the assistance of Thoros II, Lord of Armenian Cilicia. He fell into captivity in the Battle of Artah in 1164, but the victorious Nur ad-Din, atabeg of Aleppo released him to avoid coming into conflict with the Byzantine Empire. Bohemond went to Constantinople to pay homage to Manuel I Komnenos, who persuaded him to install a Greek Orthodox Patriarch in Antioch. The Latin Patriarch of Antioch, Aimery of Limoges, placed Antioch under interdict. Bohemond restored Aimery only after the Greek patriarch died during an earthquake in 1170. Bohemond VII was the count of Tripoli and nominal prince of Antioch from 1275 to his death. The only part left of the once great Principality of Antioch was the port of Latakia. He spent much of his reign at war with the Templars (1277–1282). The Siege of Tripoli lasted from 1102 until July 12, 1109. It took place on the site of the present day Lebanese city of Tripoli, in the aftermath of the First Crusade. It led to the establishment of the fourth crusader state, the County of Tripoli. The Fall of Tripoli was the capture and destruction of the Crusader state, the County of Tripoli, by the Muslim Mamluks. The battle occurred in 1289 and was an important event in the Crusades, as it marked the capture of one of the few remaining major possessions of the Crusaders. The event is represented in a rare surviving illustration from a now fragmentary manuscript known as the 'Cocharelli Codex', thought to have been created in Genoa in the 1330s. The image shows the countess dowager Sibylla of Armenia and Barthélémy Mansel, Bishop of Tortosa sitting in state in the centre of the fortified city, and Qalawun's assault in 1289, with his army depicted massacring the inhabitants fleeing to boats in the harbour and to the nearby island of St Thomas.